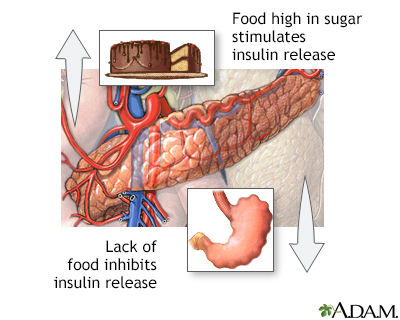 Insulin is a hormone produced by the pancreas to control blood sugar. Diabetes can be caused by too little insulin, resistance to insulin, or both. A sugar called glucose enters the bloodstream. Glucose is a source of fuel for the body. An organ called the pancreas makes insulin. 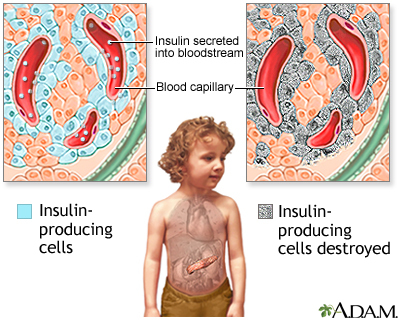 The role of insulin is to move glucose from the bloodstream into muscle, fat, and other cells, where it can be stored or used as fuel. Type 1 diabetes is less common. 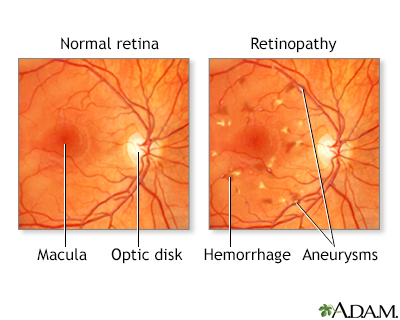 It can occur at any age, but it is most often diagnosed in children, teens, or young adults. 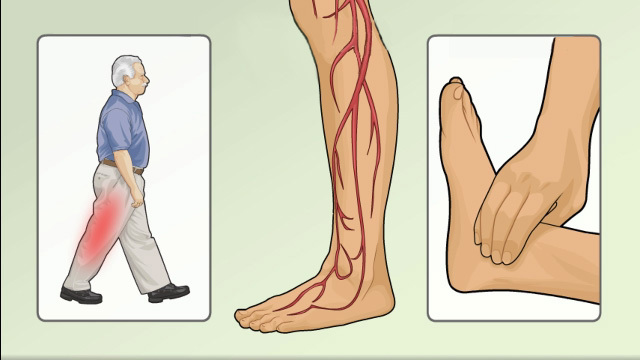 In this disease, the body makes little or no insulin. This is because the pancreas cells that make insulin stop working. Daily injections of insulin are needed. The exact cause of the failure to make enough insulin is unknown. Type 2 diabetes is more common. It most often occurs in adulthood, but because of high obesity rates, children and teens are now being diagnosed with this disease. Some people with type 2 diabetes do not know they have it. With type 2 diabetes, the body is resistant to insulin and doesn't use insulin as well as it should. Not all people with type 2 diabetes are overweight or obese. 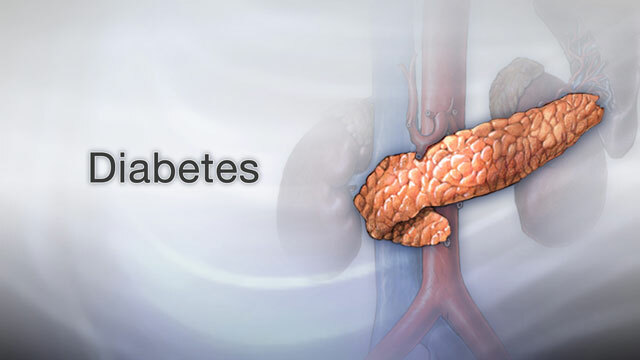 There are other causes of diabetes, and some people cannot be classified as type 1 or type 2. If your parent, brother, or sister has diabetes, you may be more likely to develop the disease. A urine analysis may show high blood sugar. But a urine test alone does not diagnose diabetes. Your health care provider may suspect that you have diabetes if your blood sugar level is higher than 200 mg/dL (11.1 mmol/L). To confirm the diagnosis, one or more of the following tests must be done. Fasting blood glucose level. Diabetes is diagnosed if the fasting glucose level is higher than 126 mg/dL (7.0 mmol/L) on two different tests. Levels between 100 and 126 mg/dL (5.5 and 7.0 mmol/L) are called impaired fasting glucose or prediabetes. These levels are risk factors for type 2 diabetes. Hemoglobin A1c (A1C) test. Normal is less than 5.7%; prediabetes is 5.7% to 6.4%; and diabetes is 6.5% or higher. Oral glucose tolerance test. Diabetes is diagnosed if the glucose level is higher than 200 mg/dL (11.1 mmol/L) 2 hours after drinking a sugar drink (this test is used more often for type 2 diabetes). Overweight children who have other risk factors for diabetes, starting at age 10 and repeated every 3 years. Overweight adults (BMI of 25 or higher) who have other risk factors such as having high blood pressure, or having a mother, father, sister or brother with diabetes. Adults over age 45, repeated every 3 years. Type 2 diabetes can sometimes be reversed with lifestyle changes, especially losing weight with exercise and by eating healthier foods. Some cases of type 2 diabetes can also be improved with weight loss surgery. There is no cure for type 1 diabetes (except for a pancreas or islet cell transplant). Treating either type 1 diabetes or type 2 diabetes involves nutrition, activity and medicines to control blood sugar level. Everyone with diabetes should receive proper education and support about the best ways to manage their diabetes. Ask your provider about seeing a certified diabetes educator (CDE). Getting better control over your blood sugar, cholesterol, and blood pressure levels helps reduce the risk for kidney disease, eye disease, nervous system disease, heart attack, and stroke. To prevent diabetes complications, visit your provider at least 2 to 4 times a year. Talk about any problems you are having. 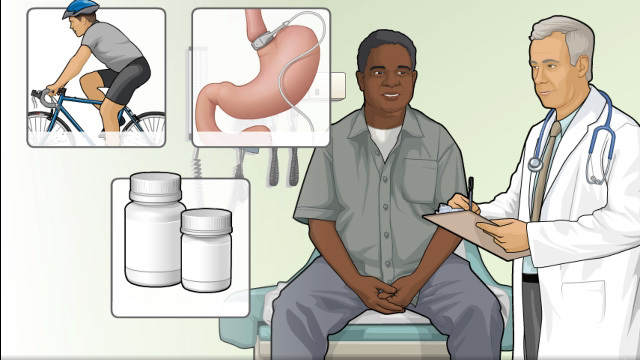 Follow your provider's instructions on managing your diabetes. Many resources can help you understand more about diabetes. If you have diabetes, you can also learn ways to manage your condition and prevent diabetes complications. Diabetes is a lifelong disease for most people who have it. Your immune system can weaken, which can lead to frequent infections. Keeping an ideal body weight and an active lifestyle may prevent or delay the start of type 2 diabetes. If you're overweight, losing just 5% of your body weight can reduce your risk. Some medicines can also be used to delay or prevent the start of type 2 diabetes. At this time, type 1 diabetes cannot be prevented. But there is promising research that shows type 1 diabetes may be delayed in some high risk people. American Diabetes Association. 2. Classification and diagnosis of diabetes: standards of medical care in diabetes - 2018. Diabetes Care. 2018;41(Suppl 1):S13-27. PMID: 29222373 www.ncbi.nlm.nih.gov/pubmed/29222373.